What's Going on With the Tree Bark? 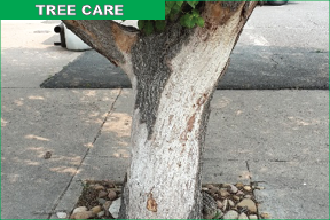 Many thin-barked trees in Eads and southeast Colorado have detaching bark or already detached bark. What's going on? 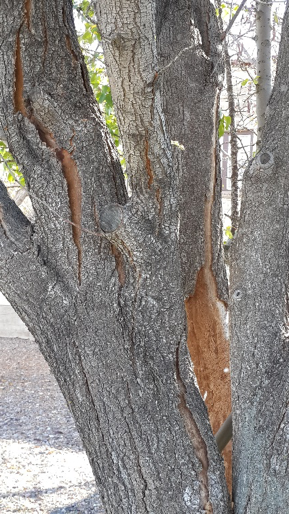 The general theory is the polar vortex of November 2014 may have caused partial bark detachment in thin-barked trees - fruit trees, ornamental trees, willows, etc. This became more evident toward the end of last summer 2015 - even as the tree crowns maintained full foliage throughout the summer. 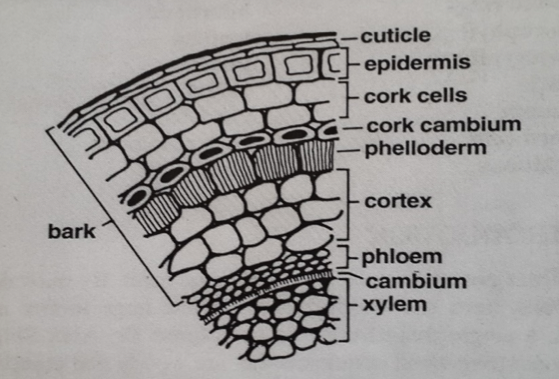 One theory is that the bark detached at the cork cambium (see ISA diagram) - leaving the phloem (sugars transport area), cambium (the living growth area of the tree), and the xylem (water conducting vessels) intact. This brings the next question - Will the trees survive? The short answer is we are not sure. 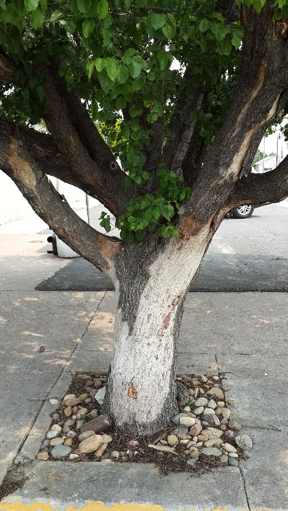 Can the trees survive with thinner than normal bark until replaced over time as the trees grow? It may depend on the trees health going into this new scenario, present tree watering and care practices, and weather variables in the future. Continue deep watering in the root zone is always suggested for our southeast Colorado area. Two good brochures regarding watering - SaveOurShade spring.pdf and Save Our Shade fall.pdf are available on the internet. For more information or a field visit contact the Town of Eads for the Eads community forester work days this summer. Aristocrat Pear with detaching bark August 2015.